Meet Taylor, foster dog #79. But don’t let him fool you. He looks like such a calm puppy, yes? Um no. This guy is a treeing walker coonhound, although he looks like the offspring of a beagle and a giraffe (seriously: his legs are crazy long). This past fall, I sprung (sprang?) Taylor from the Clarendon County Animal Shelter in Manning, SC and delivered him to my foster-in-crime, Brianna, who said she’d be his foster-momma during his heartworm treatment, which had to be completed before he headed to a waiting rescue up north. Enter: a month of me carting him back and forth to vet appointments and Brianna taylor-proofing her house. Photos on the end table? Moved, b/c his wagging tail kept knocking them over. Couch cushions? Moved, b/c couch cushions (especially white ones) are.his.favorites. Double-stacked baby gates? Deployed, b/c it takes two to keep this dog from jumping from one permissible room to the other prohibited one. 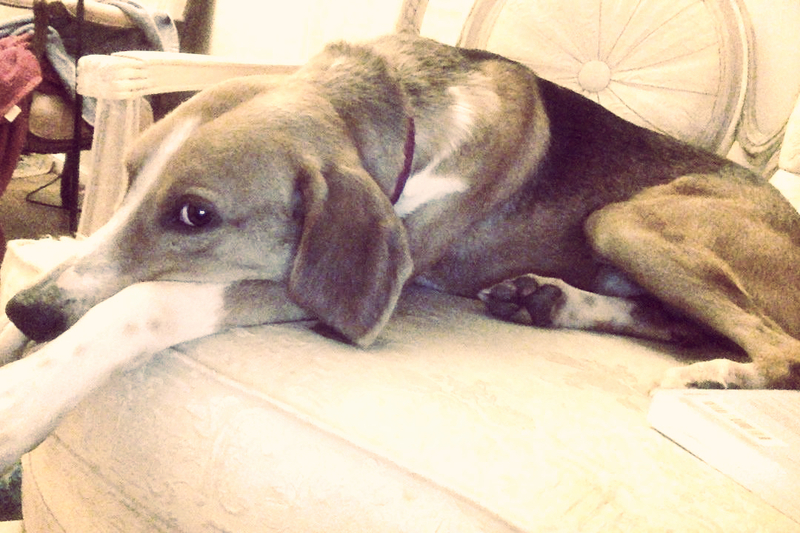 The last time I took him to the vet, for his health certificate, before seeing him off … I told the staff about the fabulous-Brianna, whose first foster was a treeing walker coonhound, that she fostered in a teeny-tiny apartment. Yep — (1) b/c she’s awesome; and (2) b/c I’m a disaster (I *could* have picked an easier one); and (3) b/c Taylor’s big goofy smile and adventurous spirit made (nearly?) every minute completely worth it. 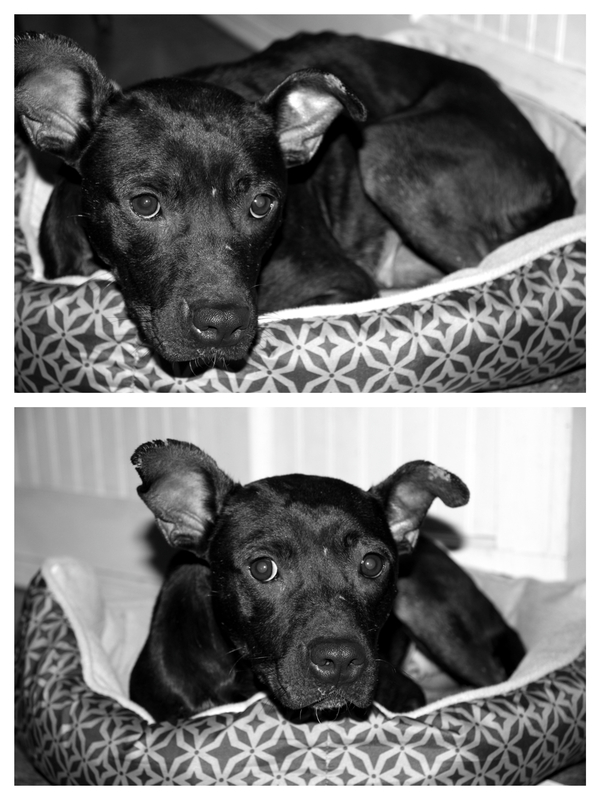 Meet Beth, foster dog #80. Right before Christmas, Beth and four of her furry companions were liberated (thank you Chesterfield County Animal Shelter) from a dog-fighting ring. 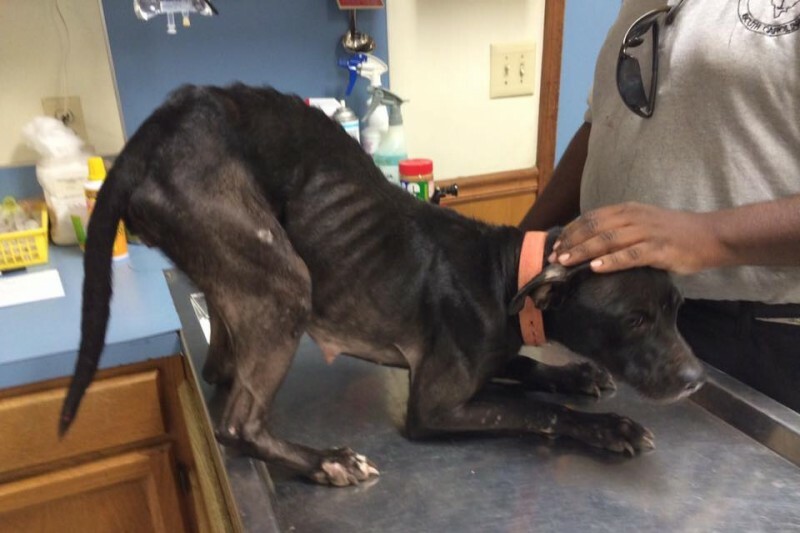 Beth was a breeding dog, not a fighting one, but you can tell from the photo that she had been starved and neglected. 1. Beth as an inside dog: the first time I brought Beth inside, she was *terrified. * She went flat on her belly with her legs splayed out beside her. I had to pick her up, put her in a room with food and water, and let her be, b/c she had some major sensory-overload going on. She learned fast, though, that inside is better than out, and the next challenge was getting her to go outside to potty, which required much wrestling. 2. Beth and potty-training: We assume Beth had been chained most of (if not her entire) life, b/c — at first — she would pee (and poop — yuck!) wherever she was standing. The luxury of being able to sniff around and find a spot seemed completely new to her. Thankfully, she mastered this new skill quickly. 3. Beth and toys: At first, she ran from the strange squeaking balls of fluff, but now she *loves* them. Playthings that appear solely for her amusement = proof that, somewhere, there is a benevolent doggy god with whom she has found favor. More proof that there is a benevolent doggy god with whom she has found favor? Dog. beds. It would be fair to say that Beth’s a fan.